The perfect helmet ally! Whatever the weather, sunny or foggy, it is important to protect your eyes! Spherical or cylindrical lenses, narrow, medium or wide, the choice is difficult, so how to choose a ski mask? All masks provide 100% protection from Ultraviolet. The main difference comes from the level of protection according to the brightness to avoid glare or poor visibility. For low light conditions, the color will tend to accentuate the contrast such as yellow, orange or pink For good weather conditions, the mirrored screens are used to reflect a maximum reverberation. 2. SINGLE OR DOUBLE SCREEN? 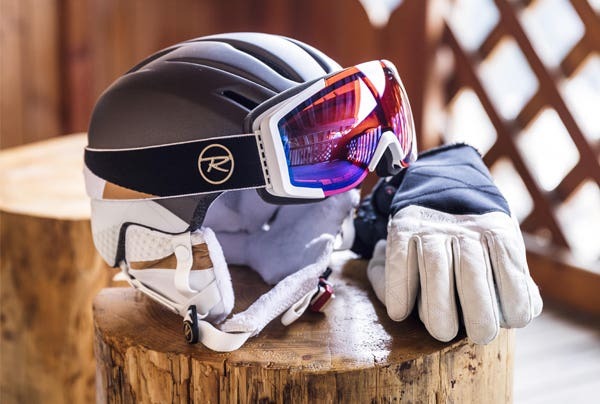 Rossignol goggles that have a single screen have an anti-fog coating on the inner face of the lenses. This technology is very effective when you do not wipe the inside of your goggles. A ski mask with a double screen will allow you to prevent fogging permanently. It has an insulating air pocket between the two screens that prevents fogging inside the mask. This allows you to ski comfortably and safely throughout the day. Good ventilation inside the mask also prevents the temperature difference with the outside, and thus reduces the chances of creating condensation and thus fogging. The number of foam thickness and quality is an important element to consider. 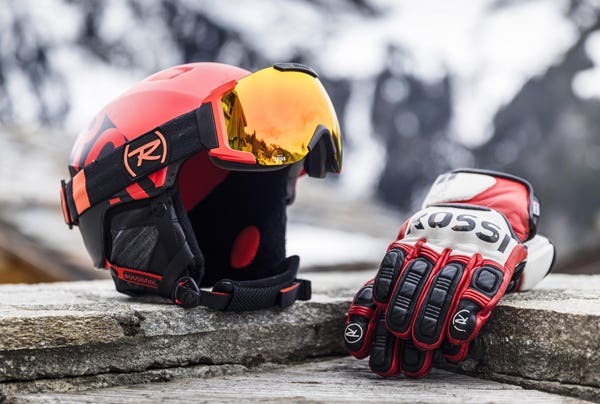 With double or triple density foam, the Rossignol goggles offer comfort. Triple density foam will give you a better fit. It is also important to adjust the shape of the goggles and its size to the shape of your face. Depending on the shape of your face chose a suitable type of goggle: small, medium, or large. Obviously, the screen must cover the entire eye. The ski goggles should not be tight on the nose. Also, remember to adjust the strap correctly. The lenses are either cylindrical or spherical. The spherical lenses are flat. The shape of the glass follows the shape of the retina in order to minimize the distortion. In contrast, cylindrical screens have a more rounded appearance. They offer a wide vertical and horizontal vision. This allows for a larger sight and therefore better comfort during your runs. Tip : Our OTG mask If you were prescription glasses, the OTG goggles (Over The Glasses) are made for you. Designed to be worn over glasses the OTG goggles tend to be a little wider in order to comfortably accommodate eyeglasses and ensure good air circulation inside the mask to minimize fogging. Now that you know how to adapt your goggles according to the weather, your face and your requirements, you are ready to enjoy the snow, with absolute safety and comfort. However, if you want personalized advice, do not hesitate to get in one of our many shop storelocator. Vents: allows cool air to enter from below the mask and discharging the hot air and moisture from above the mask. This helps regulate temperature and prevent fogging. Cylindrical lenses: The cylindrical lenses from Rossignol are made from polycarbonate cut, formed, assembled with the inner lens. The glass is flat, and the final curve is given by the shape of the mask. Spherical lenses: The spherical lenses are injected into their defined bending, and then cut and assembled with the inner lens. The shape of the lens follows that of the retina, for a minimum optical distortion. Strap: A wide strap ensures a perfect fit. It can be equipped with a hook for easy positioning on the helmet. Foam: It can be a simple triple density to perfectly fit the shape of your face, with reinforcements fleece for comfort, hypoallergenic or not. Frame: To ensure your comfort, it must be flexible. OTG: Over The Glasses, Some frames allow the glasses under the mask.